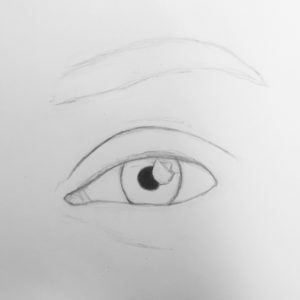 How to draw an eye? 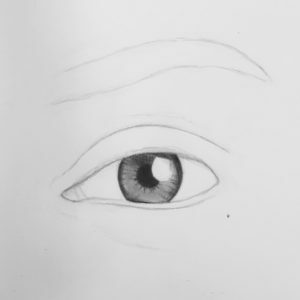 For this blog post I thought it would be nice to go back to the basics of portrait drawings: the eyes. 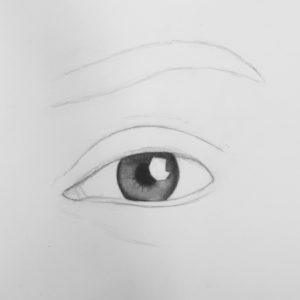 You can also see this blog as an addition to Annelies’ article, namely: how do I start drawing portraits? 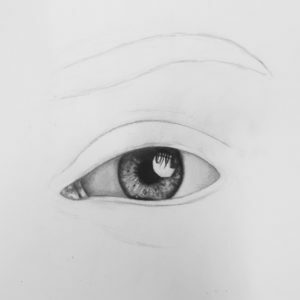 In this article, we focus on what really makes a face expressive: the eyes. They are not called ‘mirror of the soul’ for nothing. The photo is quiet, front-sided, fairly sharp and without too much make-up. Even though there are many art materials available, after more than 10 years of drawing, I found out that the materials listed above work the best for me. These are the materials that I use for every black and white portrait. I definitely recommend using similar materials. 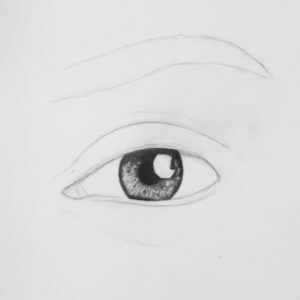 Especially thick paper, a mechanical pencil and a gum pencil will give a lot of improvement in your drawings. 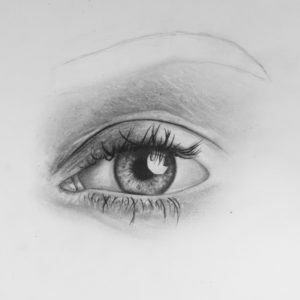 On thick paper you can build more layers, and with a mechanical pencil and a pencil eraser you can work much more detailed because of their thin points. A drawing actually consists of two parts: sketching and coloring. It is therefore important that you have the basis sketch on paper first. Try to trace your reference picture as a kind of coloring picture for yourself. 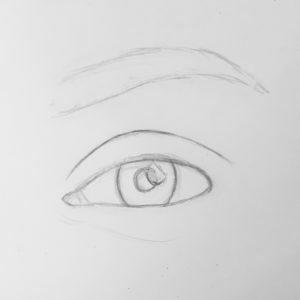 Ask yourself: ‘Which lines are important and will I use during the process of coloring?’ It is mainly about the base: the eyelid, the tear duct, the pupil, the iris, the eyebrow shape and the highlights. 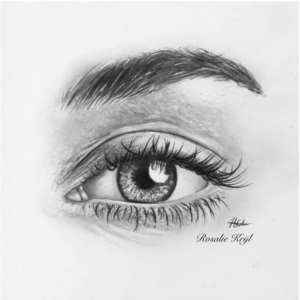 The highlights in the eye are usually a reflection of light from the environment (such as a window). Often you can see some eyelash hairs as a shadow that block the light. 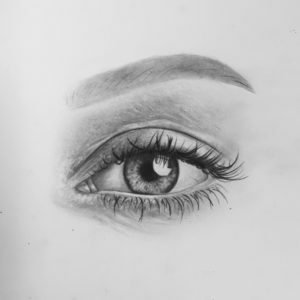 For the sketch it is useful to use an HB-2B pencil so that you do not make the lines too dark, as you also do not want the sketch to be visible in the end. If you are satisfied with your sketch, you can start to colorize after erasing unnecessary lines. I always work from the inside out because you can apply corrections even better if necessary (especially the proportions). Color the iris carefully tight and dark. You get the best result by working in layers. Color the iris, wipe the pigment with a stumper and color another layer over it. Continue until it is evenly dark gray. It is important that you do not fill in the reflections with pigment already. If these remain white you will eventually get a much nicer contrast and a shiny effect. 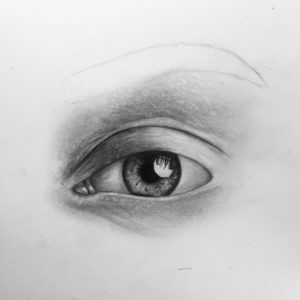 The coloring of the pupil can be done with a softer pencil. I use 2B myself but as long as you work softly and in layers you can also use up to a 6B pencil. The iris is an area with a lot of depth and details. Both dark and light shades are close together. It is therefore important to have gray as your basic tone. Later on you can draw over dark areas and erase light details. Personally, I achieve the softest colored result using a stumper. 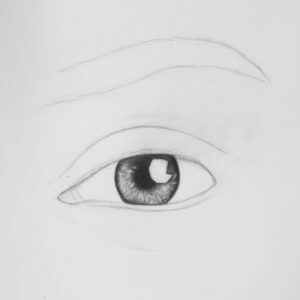 So actually you fill in the iris with the graphite that is still on your stumper (mine are always dirty). To make sure that your stumper does not leave any nasty stains, I first wipe off the first layer of graphite that is still on, on a loose sheet of paper. I always color with my stumper by making circular movements. Continue until your iris is evenly light gray. Do not forget to keep your highlights in your iris and pupil white. The edge around the iris is almost always darker than the rest of the eye because of shadows and a higher density of structures in the eye. At the top of the iris (against the eyelid) there is almost always a shadow present. We are now going to draw extra shadows over the iris that we have just colored. To build up solid saturations for your shadows, I will advise to work in layers and to use a soft pencil (2B-4B). You apply the shadow with gentle sketching movements while pressing the pencil on your paper. This gives you a nice blended effect with nice contrast.Furthermore, we will work on the lines in the iris. They scatter out of the pupil like a kind of sun, as well as from the edge of the iris. It is important that you draw different lines. Think of thin and thick lines but also light and dark lines. This gives a more realistic appearance. Build up the lines again. Spontaneous sketching lines often look more realistic than very straight lines. To make everything look nice and smooth, we will blend everything softly. For this you can use both a stumper and a cotton swab. You will see that some dark lines become more blurred. This can be fixed by re-drawing certain lines. As you may notice, we are drawing in layers again. There are no guidelines for how many layers are needed. This is a matter of continuing until you see a nice contrast, but everything also nicely overlaps. I usually need two to three layers (blending – drawing – blending – drawing – blending – drawing). 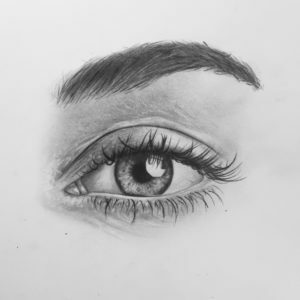 Now that you have many highlights you will see that your eye looks a lot more realistic but also has become a lot lighter. 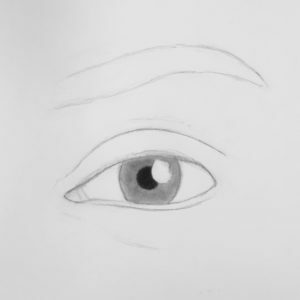 To create a beautiful contrast, you move your pencil one more time along the darkest shadows and the sharpest edges. For example, it is nice to have a dark shade next to a white shape so that it becomes even more striking and conveys depth. Erasing and drawing shadows over it can be repeated several times until you are satisfied. You work here again with layers. It is now time to work out the big highlights. This is the great reflection of light that you can see in the eye. This can be one reflection but it can also be multiple. The eyelashes can often be seen in a reflection. This is because eyelashes prevent the light from shining in the eye. This is especially true if the reflection is high on the eye. 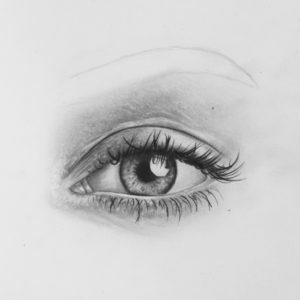 We will focus on drawing the eyelashes later on. If you like it, you can also make the lightest spots and lines in the iris stand out even more by adding highlights with a white gel pen. I always use the signo uniball for this step. The eyeball is never completely white. If this were to be the case, this would look flat and unrealistic. Because it is a ball, there is almost always a shadow around the edges of the eye and light falls in the middle. Build this very gently with a 2B pencil and wipe it inwards. I do this again by working in layers. The light on the eyeball can eventually be made more visible by erasing. Eyelashes are the thickest at the origin and become thinner towards the end. This is why you put the most pressure at the origin and less at the end of the eyelash. Make your eyelashes more realistic by varying in length and thickness. All eyelashes do have a different lenght. Often, I start with a few long lashes and I use the smaller thinner hairs to fill everything up.Eyelashes also overlap. Take a good look at your own lashes. Step 1: Determine the direction of the eyelashes. Start by drawing a number of long eyelashes spread over the lash line to determine the direction and curve. After that, it is easier to place the other lashes in between. If we have drawn a few hairs that indicate the direction in each area we can draw more lashes in between them. Do not forget that the direction and bending is a guideline. There are always lashes between them that do not run perfectly. Play with length, thickness and direction. We fill the lash line even more by drawing small hairs. They often stick to other eyelashes. Keep this in mind. With eyebrows a lot is the same as with the eyelashes. 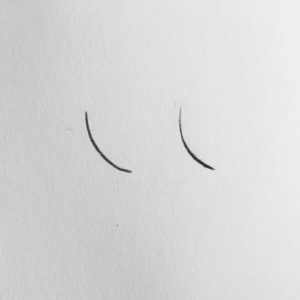 Eyebrow hairs are also thicker at the origin and end in a sharp point. Normally this step would be: ‘drawing the outline’ but we have already done this at in the beginning of this tutorial. Color the alignment shape very light gray. This provides a nice base for adding hairs later on and making it whole. Start as with the eyelashes with a few eyebrow hairs in each area. Look carefully at the hair direction. At the start, the hairs run from the bottom to the top, then horizontally and on the outside more from the top to the bottom. Fill your eyebrow with hair. Keep track of the origin and the direction, but do not be afraid to keep variation. Especially in men, we see that the hairs run in random directions. A neat and predictable eyebrow hair pattern looks unrealistic. So keep track of the growth direction per zone but also play something with some hairs. To make the eyebrow a little less rough, I often go over it with a stumper. Also here I recommend to work in layers as some hairs will fade when you start blending. Continue blending and drawing until you have found a nice balance between softness and contrast. 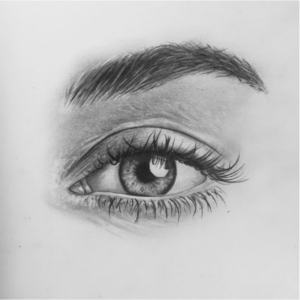 If everything is neatly on paper and you are satisfied with the eyebrow, it’s time to zoom in. Are there dark spontaneous hairs that you have forgotten? Are there some extra highlights to be found? In most cases there is sometimes some light glimmering on some hairs. You can replace the hairs in a few places with some erased lines. This way, your eyebrow gets so much extra depth. Work in layers by gently leaving graphite on your paper every time, blending it and then applying details with a pencil or an eraser. Repeat this several times for the most blended and realistic effect. Notice that erasing is also actually drawing. Play with your pencil eraser and you will see endless possibilities! Practice drawing hair on a another sheet of paper or practise in your sketchbook. Find out which way works best for you. This blog has become a bit longer than expected. I hope you learned something from it. Please show your results because I am very curious!